With the constant exposure to different weather conditions, canvas shade sails take a serious beating. While these materials are known to last up to 10 years with proper care and maintenance, over time, you may need to consider replacing them, especially if the integrity of the fabric is compromised. Why Is Good Shade Sails Important? Australia has been known to have the highest rates of skin cancers in the world. The major cause of skin cancer is the exposure to UV radiation from the sun. With this in mind, it is critical to invest in canvas shade sails that offer good protection against UV radiation since most cases of skin cancers can be prevented. 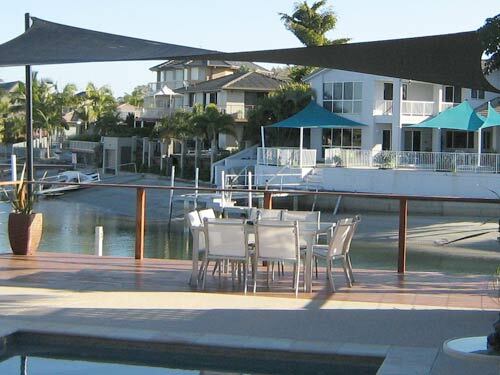 By investing in a sturdy, premium quality Gold Coast shade sails, you and your loved ones can enjoy the outdoors without the constant threat of over exposure to the harmful UV rays. What Is A Quality Canvas Shade Sails? When it comes to shade sails and when considering on investing on a new one, it is important to keep in mind a different fabric have different UV radiation absorbing capability. If you want to ensure less UV radiation pass through your shade sails, then it’s best to choose tightly woven fabrics. Darker shade sail colours are also known to be more effective in blocking the UV radiation. So, if your canvas shade sails are already worn out and faded, you may not be enjoying the best possible protection you expect. It is also important to know that overstretched, worn out and wet fabrics have considerably reduced UV radiation protection. This is why if you have determined that your shade sails are past its usability, it is best to consider getting a replacement rather than a repair. When investing in shade sails, it is highly recommended to work with a reputable supplier to help you assess your location as well as provide tips and advice on how you can get the most out of your investment.